So, in our previous part we discussed some of the best SEO tricks that online marketing experts use to get maximum traffic to their blog posts. We ended the session with the use of images in the blogs. Now, let’s continue the session with more of such tips from experts. As bloggers; our main task is to help users find proper answers to their questions. The Web page URL is the part of the puzzle. The first thing that people see in search engines is the title, description and URL. All these characteristics influence the user behaviour and compel them to click. The more the CTR, the more benefit you get from Google. If all other parameters are equal then your web page will rank up higher in search results. The blogs of Neil Patel have URLs generated automatically based on the post name and publication date. URLs generally consist of 3- 5 words which makes them short and easily readable. How many broken links do you have even though they are not available on the internet? People usually make misprints when they provide links to you. All these things lead to 404 page and then they are unable to find the content. This means that the page in question is not found anywhere and as a result; users will likely leave your blog for good. Some CTAs are so attractive that they compel visitors to download the free eBook. Call to Action is of equal importance as compared to About Page on the blog and as a result; many people forget about it; experts are no exception. This page also affects the page ranking in the search results. One can make use of several tools to identify 404 error pages on your blog. These tools can be Google Analytics, Google Search Console, and Screaming Frog SEO Spider. 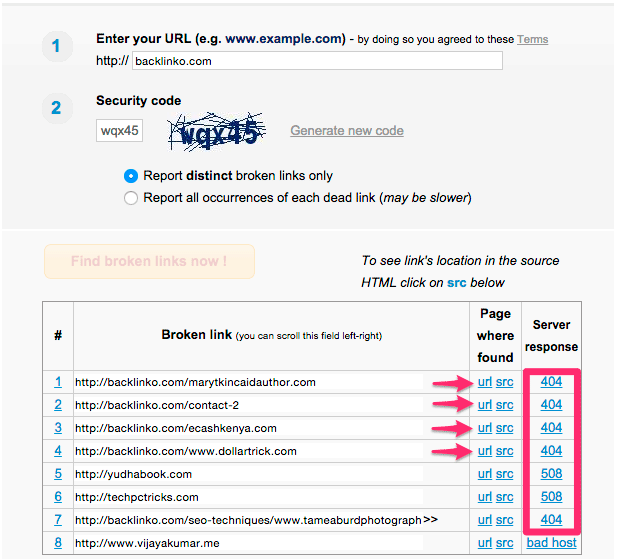 Broken Link Check is an excellent tool that is used to find broken links. One can also find broken links on the websites to which you can give links. Loading time affects your website a lot. Thos web pages that take more time to load are easily abandoned by visitors. Normal users lack patience when they are surfing internet and they want website pages to get loaded slowly. Slower page response time results in increased bounce rate. People will likely to go for those sites which get loaded quickly. Speed is still a factor which is of prime importance. During recent years, Speeds have increased to an extent. A few years ago; speed was not given much importance. At present, fast internet speed has become reality. The reason; when it comes to internet we are addicted to have quick results as Google offers thousands of results within seconds. In case your content is not loaded completely then users are likely to wait for great images and styles, background and icons, menus and sidebar. Normally; every single web page should get fully loaded within 2 seconds. Several tips for improving the loading speed of web pages are available. These also include various plugins. Here’s what experts have selected for hosting their website? I mean to say about the platforms that experts have chosen to host their sites. A blogger’s choice affects several factors like as response time, location, software installed and lots more. There are several companies that show themselves to be best in the industry as they offer the fastest hosts. One can easily checkout the hosting platform of any website. The most famous Neil Patel blog is hosted by WP Engine, Robbie Richards by BlueHost, Blogtyrant by KnownHost, Videofruit.com by WP Engine, Backlinko by Linode etc. All of these blogs have posts with on an average 4000 words and lots of pictures. Out of all these blogs; Backlinko.com by Brian Dean has the best loading speed. Brian Dean possesses a virtual cloud server with SSD drives which are configured to its needs. If you know any programmer or system administrator who has complete knowledge about server configuration then it is advisable to get in touch with him or her and get your server configured or you can also find one and pay him/her to get the server installed as per your needs. This helps you to achieve fantastic loading speed. This will be your huge investment in future. A post that is longer than 1500 words is likely to get more tweets than a post with lower words. Various posts have suggested that there should be 2000 words per post. If we take a look at blog posts by experts then be it Robbie Richards or Neil Patel; the content length is not less than 3860 words. On an average every blog post 4000 +words. So, if you want to be in competition with them then you must have such long posts. Every article must cover the entire topic as this offers proper knowledge to the readers as well as to the bloggers to achieve their goals. Neil Patel: 112 posts in 14 months. A good blog post is of no use if its off page SEO is not paid much attention to. SEO implies to work with external factors which have a deep impact on your blog or a particular page. One can control them when one has just started the blog. However, too much of time is required to be spent on the technique. Off page SEO is conducted to offer links to your information. Stunning content in any category will have links from different other websites. People will share the content via social networks. In a nutshell; we can say that experts have deeply involved in promoting their blogs and making their blogging sites a huge success. At present, we discussed about how they optimize Off Page SEO, proper placement of CTA and removal of pages that generate 404 errors. Hope this blog post will also help you to boost traffic on your website. Apart from these two parts; there are many more tricks that experts use to make their blogs a good source of income. If you wish we will also explain you remaining tricks but only upon request from our users. For more such updated blog posts; stay connected with Platinum SEO; Best SEO Packages provider in Sydney.